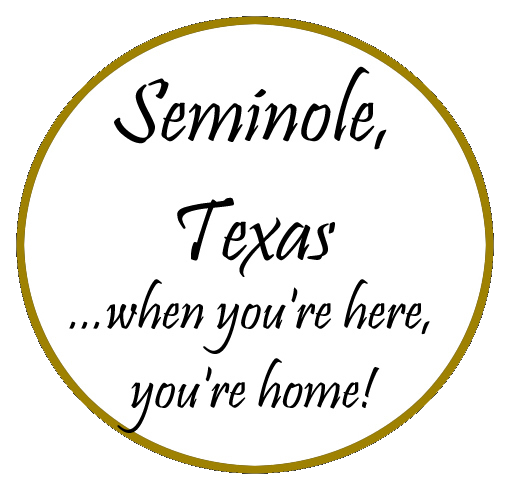 Welcome to the Seminole, Texas Chamber of Commerce website. We invite you to learn more about our organization and community using this online resource. We are a non-profit entity, governed by a board of directors that is elected by the membership. We are a diverse group as well, made up of businesses of all sizes, cultures, and shapes, along with a number of individual members. All of us share a common goal: To promote Seminole, Texas and keep its economy operating at the highest possible level. Our Chamber office is located on the courthouse square in Seminole, at 119 SE Avenue B. We respond to thousands of requests annually, both by phone and in person, which range in scope from information on the city or particular businesses to relocation and visitor packages. If you’d like to become a member of the Seminole Chamber of Commerce, contact us or learn more. Gaines County was named for James Gaines, who was born in Culpepper County, Virginia in 1779. The early culture of Gaines County was purely wild Comanche and Mexican. For a century or more before the conquest of the Plains by Americans, they were annually invaded from the west by Mexican Comancheros, or traders, almost all of whom did a thriving business with the Plains Indians. Due to the vigilance of the hardy Comanches and their fierce warlike spirit, the Americans had not been able to penetrate the eastern approaches to the Plains until the campaign of 1871-72 and 1874-75 when Cols. Mackensie and Shafter of the U.S. Army had located the waters and opened the territory for further exploration. In October 1875, Lt. Bullis of the Shafter command (24th Infantry) encountered a large bunch of Indians at Cedar Lake and took from them a large supply of food, buffalo hides, and utensils. Col. Shafter then established a camp at Cedar Lake and continued to scout the area as far south as the Pecos River. In November he reached the draw about 2 miles south of the present city of Seminole and there before his astonished eyes were one of the most amazing water development projects known to any country! In the middle of a sand-locked desert were some 50 wells, and about 3 miles further west he found about 20 more such wells, ranging from 4 to 15 feet deep. This area became a regular place to meet and trade goods. In 1883 – 1887, the northwest part of the county was occupied by the Mallet Ranch (and later the Higginbotham Cattle Company). Their foreman, Dave Ernest, was the first man to fence in this part of the country. Later the ranch was bought by a San Antonio merchant, Mr. Half. He used it to winter steers that had been driven up here, then they would be shipped to market in Kansas the following spring. In the late 1880s, the present day Gaines County was made a part of Martin County and Stanton was the county seat. The land rush in Gaines County started in 1902-1903. Four sections were allowed to be filed on for homestead purposes. After they had lived on the land for 3 years and proved up on it, the title was vested in their name. Gaines County was organized on October 24, 1905. When the land for Seminole (320 acres) was donated by non-resident landowners to be the county seat, W.B. Austin & his wife Emma decided to move their general store, then located at Caput, into Seminole. (Caput was located about a quarter mile southwest of the present-day Gaines County Cemetery). They moved the building into Seminole in the spring of 1906, although many people told them they would not be able to move the building across the draw. But they sawed the building in half and moved it in two sections by a horse. It was a tall building with an upstairs area where the Austins lived, and where Mrs. Austin ran a free hotel for passing cowboys for years. In the early days of the county, there were quite a number of post offices. Some were moved from time to time, and most of them were abandoned as transportation facilities increased. One of the first was Eclipse, located about 20 miles west and a mile south of Seminole. The Bessie post office was located at the home of Clint Dean, 2 miles south of the Hugh Wristen Ranch. The Hollebeke post office was 25 miles southeast of Seminole, first at the Pete Hollebeke place and then later moved to Florey. Another was Hatchett, located about 15 miles southeast of Seminole. Craddock was a few miles west of Cedar Lake on the east side of Sawyer Flats at the home of Dr. Craddock, and the Ashmore post office was located 20 miles east of Seagraves and about 5 miles north of Cedar Lake at the Ashmore residence. The town of Loop got its name from the cattle brand used by the ranch whose headquarters served as a post office early in the community’s history. The Loop became the name of the post office when it was established in 1912. In 1916 the post office was moved to the Parkinson home a mile south of the present town of Loop. Blythe was the name of the post office where Seagraves is now. This post office was in the home of S. J. Blythe, and when the railroad moved into that vicinity in 1917, the name was changed from Blythe to Seagraves. The Santa Fe already had one town by the name of Blythe in California, and they insisted the name be changed. After some controversy with postal officials, the name was changed to Seagraves, being named for an employee of the Santa Fe Railway, Charles Seagraves, who worked there as a traveling passenger agent. In 1917 the first building was erected in Seagraves-the office of the Spearman Land Company. Higginbotham Bartlett Lumber Company also moved there in 1917. The first barbershop in Seagraves was housed in a tent in that same year. Seagraves grew rapidly as a town, and in 1928 a major portion of the business section burned when both sides of a block-long section went up in flames. Only the Seagraves Motor Company building was left standing on the west side of the street. The town was immediately rebuilt with modern brick buildings, many of which line its streets today. At one time or another, Gaines County has been the home to as many as thirty-three school districts. Today we have three, Seminole, Seagraves, and Loop. Most of the early schools had a one-teacher, one-room school. In 1910, Dan Cobb contracted with the school board to construct a new two-story school house on the property now used for the Elementary school. Four classrooms were downstairs and the 2 classrooms upstairs completely housed the high school students as well as an auditorium. On top of the building was a cupola housing a large cast iron bell, which was heard all over town every morning. Seagraves’ first school was taught in 1917 by Miss Wee Bell Hargett in a one-room schoolhouse located approximately where the present buildings are. Around 1918, Loop acquired a one-room schoolhouse from the Williams community and joined it to their own one-room structure to form their first two-teacher school. The first bank to open was the Seminole National Bank in 1906, followed by the First State Bank in 1907. Bank robbers got away with more than $3,000 from the Seminole National Bank in 1912; the two banks consolidated as the First State Bank in 1914. First State Bank opened in Seagraves as well in 1917. The fifties were a busy decade for Gaines County. In 1950, Seminole’s population increased to 3,480 and surpassed Seagraves in population for the first time. A new hospital was built in 1953, and the city water system was enlarged in 1954. The Gaines County Library opened in 1958. By the end of the decade, Seminole’s population had soared to 5,737. Today it stands at just over 6,000 after several declines and slow growth in the 70s and 80s. The population of Gaines County, however, has grown to over 14,000. A great addition to Gaines County came in 1977, when the first group of Mennonites arrived to set up farming and ranching operations, some 156 families. Today, Gaines County is home to approximately 3,000 Mennonite families. The Mennonite community celebrated their 25th Anniversary in August of 2002. In 2005, Gaines County continues to be the number one oil-producing county in Texas, the number one cotton-producing county in Texas, and the number one peanut-producing county in Texas. The hospital district has expanded to include a health care center, a family medical clinic, a fitness/rehabilitation center, an assisted living center, and home health care. Our school districts boast state-of-the-art facilities. Our county is served by the Seminole Sentinel, which is the oldest business in the county, and KIKZ-AM/KSEM-FM radio station with country, German, and Hispanic programming. Gaines County Airport, located 3 miles south of Seminole, is a modern facility with a fixed-base operator and a 5,000 foot paved and lighted runway. On this, our century mark, we think Gaines County looks pretty good for 100 years old. We look forward to growing even stronger in the future! 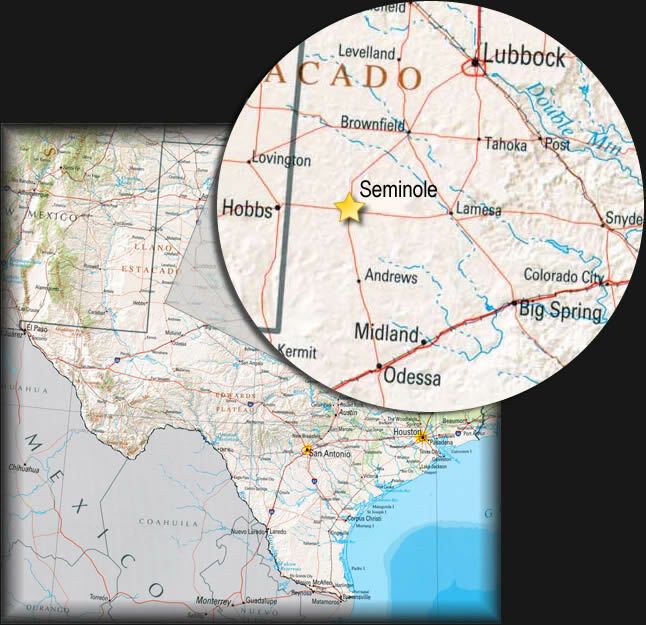 Seminole, Texas is a community of over 6,700 individuals located in the northern part of the oil-rich Permian Basin and on the southern edge of the agricultural South Plains of Texas. The economy is primarily dependent on oil production and agriculture. Gaines County has ranked among the top two counties in the state in both oil and cotton production for many years. In addition to a strong agriculture and oil economy, Gaines County enjoys a low crime rate, low unemployment rate, favorable climate, and easy access to the mountains of New Mexico, the sandhills of West Texas, and the rugged wilderness of the Big Bend area. Indeed, Seminole is a QUALITY community in which to work, play and raise a family. Seminole enjoys the luxury of many excellent facilities, including a well-equipped and staffed Volunteer Fire Department, an Emergency Medical Service, a scouting center, a youth center, a community chapel, an assisted living center, several community parks, a Senior Citizens facility, a modern airport with a fixed-base operator, over 100 motel rooms, 159 hotel rooms, excellent convention facilities, an AM-FM radio station with country, German, and Hispanic programming, and numerous churches with services performed in English, Spanish, and German. The Seminole Independent School District is one of the most fortunate districts in the state due to the high volume of taxes generated through the country’s oil production. Our schools provide top quality education in its one primary, two elementary, one junior high and one high school. Seminole is a Class 3-A high school and offers, in addition to regular academic courses, studies in humanities, fine arts, vocational training, and physical education. The high school, built in 1980 at a cost of $6.6 million, houses a unique floor plan and includes an Olympic-sized swimming pool. The faculty is comprised of over 200 professionals and nearly 150 auxiliary personnel. The athletic programs include football, boys/girls basketball, girls’ volleyball, boys/girls track and field, and an extensive summer recreation program for all ages. Seminole is also within easy driving distance of 5 colleges and 3 universities. “A good place to live and raise your kids” is a statement many folks make about Seminole! There are a lot of activities to keep the kids busy year-round, not only within the school system but in the city and county as well. That’s not to say adults are left out, since there are plenty of civic clubs and recreational facilities to please everyone. For the whole family, there are activities planned throughout the year that whet the appetite. In January, the annual Gaines County Junior Livestock Show spotlights the talents of 4-H and FFA youth. Youth basketball takes the stage in February, and during the summer youngsters can stay occupied with youth baseball, softball, and T-ball leagues, while the older youth can join the M.S. Doss Youth Center. The annual Seminole Drifters Riding Club Rodeo is held in June, along with the annual Gaines County Pro-Am Golf Tournament. In July, there is a fireworks display that culminates a full day of festivities, and throughout the summer months residents can participate in Summer Community Theater, either as a cast member or an audience member. In September, the Chamber hosts the annual Ag and Oil Appreciation Day to salute Gaines County for being the top cotton producer, top peanut producer and top oil producer. The year ends with December’s annual nighttime Christmas parade traveling through the main streets of Seminole, heralding Santa’s arrival on the square!